Drones are pretty interesting and versatile pieces of technology. They can be used for surveillance, high-speed video capture, package deliveries and even ocean rescues. However, as their popularity grows, so too does their associated risks - specifically regarding the devices sharing the sky with larger, more dangerous aircraft. To that end, Bloomberg reports government investigators are looking into what could be the first-ever drone-linked aircraft crash. According to the report, a helicopter crash-landed in Charleston, South Carolina, this week after a civilian drone reportedly interfered with its flight path. A Charleston police report says the crash happened on Wednesday when a student pilot and instructor saw a "small drone" hovering directly in front of them. In a bid to avoid a dangerous collision, the instructor quickly attempted to take over for the student. Unfortunately, the helicopter's tail reportedly struck a "tree or bush," resulting in a crash landing. The good news is neither the student pilot nor the instructor were injured in the crash. The same cannot be said for the helicopter which reportedly suffered significant tail damage. ...neither the student pilot nor the instructor were injured in the crash. It's worth noting the incident occurred over an undeveloped piece of land far from any nearby airports or other "no-fly" zones so it's unlikely any other civilians were put in harm's way. The drone in question appears to have been a DJI Phantom - a small, white four-rotor device. Due to the Phantom's color and size, it's possible that its pilot simply lost track of it in the sky while the helicopter happened to pass overhead. 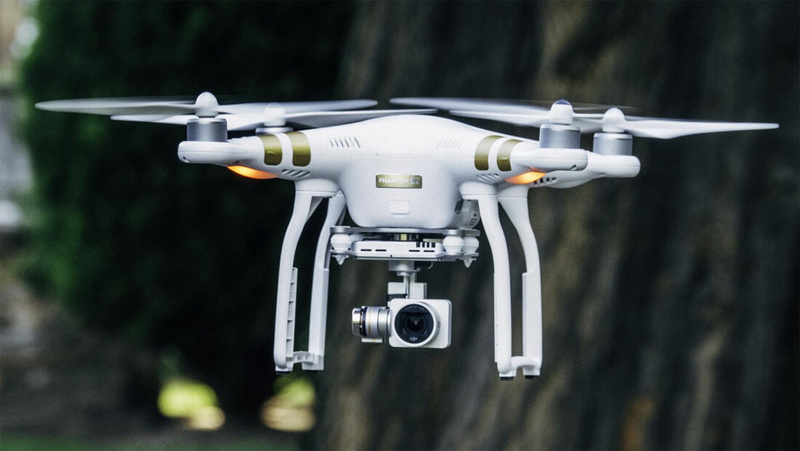 DJI says they "[stand] ready to assist investigators" as needed and has reaffirmed their commitment to acting as an "industry leader in developing educational and technological solutions to help drone pilots steer clear of traditional aircraft."